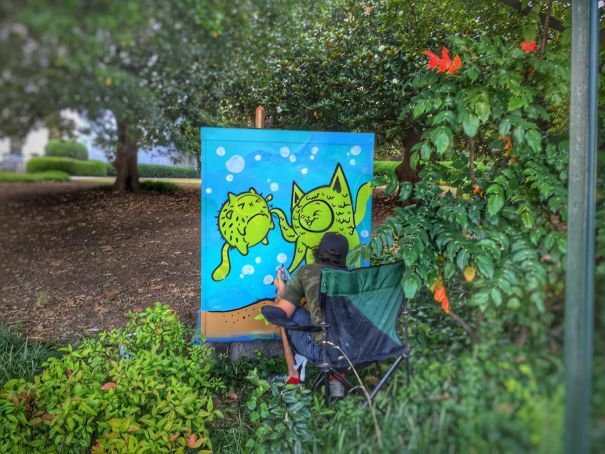 Organized by The Decatur Arts Alliance and artist Larry Holland, the Decatur Box Project organized over 25 local artists to paint signal boxes located throughout downtown Decatur. This box is located next to the Dekalb County Courthouse and features a cast of multiple underwater kittens. Full map of all the painted boxes can be found here. After the success of the Decatur Box Project, the Downtown Utility Box Project was organized by the Office of Cultural Affairs and the Department of City Planning to paint 17 utility boxes in the Downtown Atlanta area. This box is located at the corner of Washington and Mitchell Streets across from the State Capitol and right outside the Atlanta City Hall.